It's one thing to save up and plan trips to places on your bucket list, but there's also something exhilarating about throwing a dart at a map and deciding to go wherever it lands. 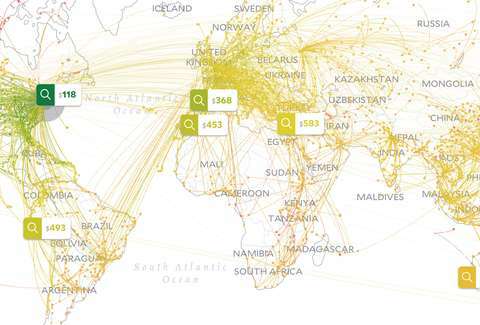 That's essentially the spirit behind this incredibly cool new map-based travel search engine, which reveals the cheapest flights from any location during a particular time period on a map, and helps you book a trip there. Escape is a unique new travel search tool that caters to anyone looking for a little inspiration for their next getaway. The interactive map shows all the places you can fly to on a certain budget from any location during a given time frame, and highlights which destinations have the cheapest flights. It was built by a team from the MIT Senseable City Laboratory in Singapore, which wanted to create something that would "help [them] picture the price landscape whenever [they] felt like taking a holiday," and, well, that's exactly what they did. The slick site looks a bit confusing to use at first glance, but it's actually quite simple. You just plug in your location and prospective travel dates and it goes to work, revealing a far-reaching web of flight paths and what they'll cost you (the cheapest destination shows up in green). From there, you can filter the selection down by using the suite of tools on the left hand side, which let you sort by budget, or by direct flights only, or even by visa requirements based on your nationality. There's even the option to sort by a place's popularity and type of weather. Also if you have a particular region, country, or continent in mind, you can restrict the results to see which cities are cheapest to fly to in that particular area. When you click on a potential flight/destination, it'll take you to a dedicated page with more information about what sort of activities you could do there, as well as a list of available flight listings culled from a variety of booking engines so you can easily pull the trigger on your trip when you're ready. A word of warning, though: if you have even the faintest inkling of wanderlust, prepare to enter quite a rabbit hole of fantasy trip planning.